The Yankees and Orioles continue their weekend series later tonight, with a 7:15pm ET game. Boy, I sure do hate Saturday night games. Anyway, until then, check out Jorge Posada’s letter to his younger self at The Players’ Tribune, then check out these stray bits of news. There is “significant skepticism” that Otani will come over to MLB this winter. Teams estimate his market value right now, at age 22, at at least $200M. Market value is not the same thing as earning potential, of course. MLB is expected to be “vigilant to ensure the sanctity of the system is not made a mockery by extralegal payments,” meaning a team couldn’t give Otani a long-term contract shortly after signing him, thereby circumventing the hard cap. AL teams believe they have an inside track to sign Otani because they can let him DH between starts. NL teams are wary of letting him play the outfield when he’s not on the mound. Otani, by the way, has been hampered by a nagging ankle issue this season. He has yet to pitch and only recently did he return to the lineup as a designated hitter. He’s hitting .407/.469/.815 with five doubles and two homers in eight games so far. My guess — and this is only a guess — is Otani will not come over to MLB this winter. I think he’ll instead announce his intention to come over next offseason, allowing teams to get their international bonus money situation in order. Right now, just about every team has agreements in place with Latin American players for July 2nd, leaving them no money for Otani over the winter. We’ll see. In the FanGraphs write-up Eric Longenhagen notes the Yankees have had “special assistants” in to see Rogers, though I should note that isn’t unusual for any player under first round consideration. Baseball America says the Yankees have been “linked to college arms all spring, but (they) also could go for the right college bat.” MLB.com links them to California HS 1B Nick Pratto (RAB profile) in addition to Canning and Rogers. 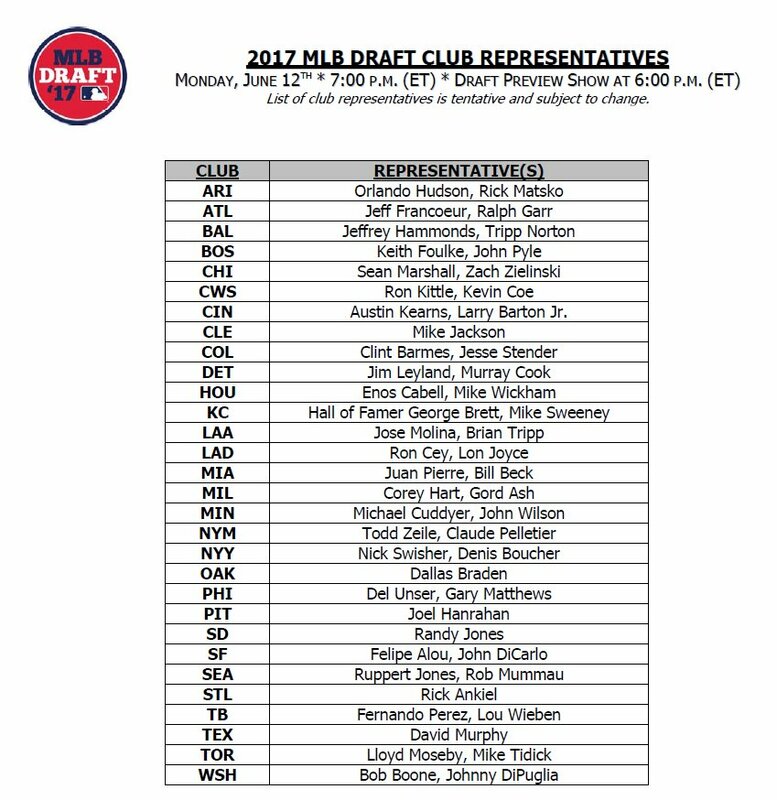 Last week MLB announced the representatives for all 30 teams for Monday’s draft broadcast on MLB Network. Nick Swisher and Denis Boucher are representing the Yankees. Here are every team’s representatives. Swisher is Swisher. He played for the Yankees from 2009-12 and was very productive. He’ll go down as one of Brian Cashman’s greatest trades. Also, when Swisher left as a free agent, the Yankees used the compensation draft pick to select Aaron Judge. That trade is the gift that keeps on giving. Boucher has been with the Yankees since 2010 and he more or less runs their amateur scouting in Eastern Canada. His MLB playing career was brief (1991-94 with the Blue Jays, Indians, Expos) and since then he’s worked to grow the game in Canada. Boucher has coached Canadian Olympic teams, in the World Baseball Classic, and a bunch of other international tournaments. He’s also been involved in developing Canada’s youth baseball program. Certainly not a household name, but Boucher has done a lot to promote the game north of the border. Pretty cool the Yankees are rewarding him with a trip to the draft. Also, I should note MLB has announced four prospects will attend the draft Monday: Greene, Rogers, Kentucky HS OF Jordon Adell (RAB profile), and Alabama HS OF Bubba Thompson (RAB profile). Would be kinda cool if the Yankees picked a kid actually at the draft, no? Judge and Ian Clarkin were there for the 2013 draft, remember. Old Timers’ Day is Sunday, June 25th this year — two weeks from tomorrow — and a few days ago the Yankees announced the list of attendees. Here’s the press release. Most are the usual suspects. Whitey Ford, Reggie Jackson, Paul O’Neill, Ron Guidry, etc. The guys we see every Old Timers’ Day. The most notable first time Old Timer is Jorge Posada. He’s the first member of the Core Four (groan) to attend Old Timers’ Day. Neat. Also, during the Old Timers’ Day festivities, the Yankees will hold a special ceremony to honor new Hall of Famer Tim Raines. Raines is going into the Hall of Fame as an Expo (duh), but he was an incredibly productive platoon outfielder with the Yankees from 1996-98. Rock hit .299/.395/.429 (120 wRC+) with 18 homers and 26 steals in 940 plate appearances those years, his age 36-38 seasons. Pretty awesome.